So I didn’t have a huge amount of free time in Phnom Penh. Most of it was spent working, or out and about drinking with new friends. However, I did manage to get a walk around the city in before leaving. An 11 KM walk around the city, which started off with S-21 (Tuol Sleng) prison. One of the only remaining sites left from the atrocities of the Khmer Rouge regime. When the Khmer Rouge took over Phnom Penh (active from 1968 to 1999), they rounded up pretty much everyone that wasn’t one of their own, intellectuals, city dwellers, minorities and sent them here or to other prisons like this. Eventually, they would even in-prison their own that they suspected of being traitors. There they were tortured until they gave a confession. Whether the confession was true or false, they didn’t care. The penalty, when they were ultimately found guilty was as gruesome as the torture that extracted it. The final fate was the death of nearly all 20,000 inmates. Only 13 ever survived S-21. In total the Khmer Rouge regime made around 2 million people flee the cities to take up agriculture in the countryside. They were responsible for killing more than 2,000,000 people. A reminder of the truly horrific possibilities of human nature. After a good 30 minutes and a beer at 11:30 am, I managed to continue on with the tour around the city. I decided I needed something a little more “easy” (for lack of a better word) on the mind and soul. So, Trip Advisor suggested the Aeon Mall nearby. Proof that Cambodia really is becoming “westernised”. This mall has everything you would find in the heart of London or New York. From there I made my way down to the HUGE construction site that is the Riverside area. 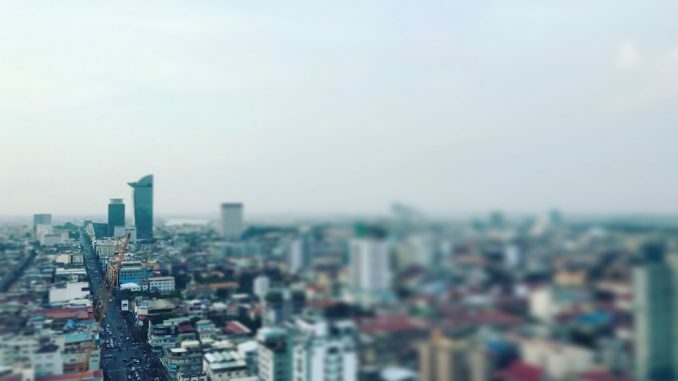 The new developments and skyscrapers that are being built shows the huge external investment that is being funnelled towards Phnom Penh and Cambodia. Finally made it north of Riverside, towards the Royal Palace. It wasn’t open for a visit and no one was willing to invite me in for a cup of tea or anything (rude, I know) so I continued on, with a quick bite to eat and then continued my walk. Went passed a car showroom, with some very slick looking cars, for any country, let alone Cambodia. Then back down to the memorial roundabout and then on home. By this point, I had been out and about for nearly 6 hours and with 11 KMs walked, it was time to get back to work at the hotel. Hope you enjoy Phnom Penh. I fell in love with the place, the people and the atmosphere. Can’t recommend it enough as a big city.